A private Dragon spacecraft is headed back to Earth from the International Space Station Sunday (Oct. 28) to wrap up a landmark mission to the orbiting lab: the first commercial cargo flight for NASA. The unmanned Dragon space capsule, built by the U.S. company SpaceX, was set free from the station by at 9:29 a.m. EDT (1329 GMT) as both spacecraft sailed 255 miles (410 kilometers) above Burma. The station's crew used the outpost's robotic arm to release the spacecraft. "It was nice while she was on board. We tamed her [and] took her home," space station commander Sunita Williams of NASA radioed Mission Control in Houston as the Dragon capsule departed. "Literally and figuratively, there are pieces of us on that spacecraft going home to Earth." "Over the next few hours, Dragon will complete a series of engine burns that place the spacecraft on a final trajectory to re-enter the Earth’s atmosphere," SpaceX officials said in a mission update. The spacecraft is expected to splash down in the Pacific Ocean, off the coast of Southern California, at 3:20 p.m. EDT (1920 GMT) and be retrieved by a SpaceX recovery crew so the cargo can be delivered to NASA. The mission is the first of 12 commercial resupply flights by SpaceX under a $1.6 billion deal with NASA. The Hawthorne, Calif.-based SpaceX (short for Space Exploration Technologies) launched the Dragon capsule toward the space station on Oct. 7 using one of the company's own Falcon 9 rockets and a pad at Florida's Cape Canaveral Air Force Mission. The capsule was packed with 882 pounds (400 kg) of supplies to for the station, including 260 pounds (117 kg) of crew gear, 390 pounds (176 kg) of scientific equipment, 225 pounds (102 kg) of hardware and several pounds of other cargo, NASA officials said. The cargo returning home on Dragon are 163 pounds (74 kg) of crew supplies, 866 pounds (392 kg) of scientific research and 518 pounds (235 kg) of vehicle hardware and other hardware, they added. SpaceX is the first robotic spacecraft ever to be capable of returning cargo to Earth. "It has been an historic mission," NASA spokesman Josh Byerly said during undocking commentary. The unmanned cargo ship built by Russia, Japan and Europe are all designed for one-way trips and are intentionally destroyed during re-entry at the end of their missions. The Russian Soyuz capsules that ferry crews to and from the space station have limited cargo return capabilities, NASA scientists have said. SpaceX is one of two companies with deals to launch cargo delivery flights on unmanned spacecraft for NASA. The other company, Virginia's Orbital Sciences Corp., has a $1.9 billion contract with the agency for at least eight missions to the station using the new Antares rocket and Cygnus spacecraft. The first Antares test flight is set for later this year. With its space shuttle fleet retired, NASA is relying on the Dragon and Cygnus spacecraft to ferry U.S. supplies to and from the International Space Station. The space agency is also supporting the development of new commercial U.S. spacecraft to launch American astronauts on space station trips. SpaceX is one of four companies currently developing manned private space taxis with NASA funding support. The company is upgrading its Falcon 9 rocket and Dragon capsules to eventually launch crews of seven astronauts into orbit. 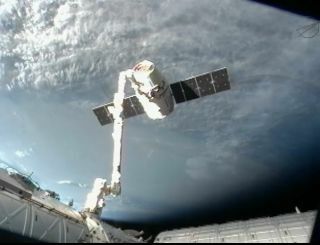 Visit SPACE.com today for complete coverage of SpaceX's Dragon capsule departure from the space station and return to Earth. Lego Is Bringing the Tantive IV from 'Star Wars' to Earth This May the Fourth!